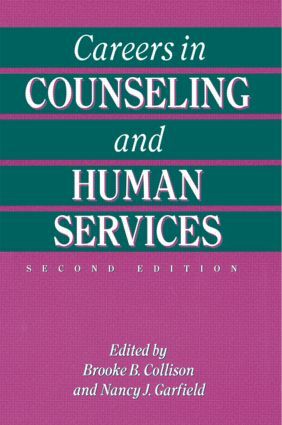 Providing information needed to make choices about different occupations in counselling and human services, the second edition of this text enables readers to examine their own strengths and limitations within these fields. ; The opening chapters examine profession and personal issues to be considered in making career choices. Next, chapters present examples of counselling and human services careers in seven different work settings, all written by professionals in that particular area: schools, higher education, business and industry, private practice, federal and state agencies, health care facilities, residential treatment, and community-based support programmes. Also included in the setting chapters is the most up-to-date salary information available. Finally, information is provided about licensure, certification, programme accreditation, and the next steps for further career decision-making. A comprehensive appendix contains current names and addresses of 63 professional associations, organizations, and licensing bodies related to the counselling and human services professions. The index lists 168 occupational titles used throughout the book. ; Giving an overview of the field, this book can be used as a supplementary text for courses in counselling and human services preparation programmes, or in high school and university courses that focus on career exploration. It is a valuable resource in any career information library or resource centre.